I have an Honor 10 AI phone (among others) and this recently upgraded itself to Android 9 “Pie”. It is always good to be on the latest Android; but I noticed a change in something I care about (though acknowledging that for most people it is not top of mind). I have found that Google Maps works badly on GPS-only, but other mapping apps like HERE WeGo work fine. However, following the upgrade to Android 9 on the Honor 10 AI, my use of HERE WeGo was blocked. This is coercive, in that mapping is a core function of a smartphone. And it is unnecessary, since I know for sure that this app works fine without the Wi-Fi scanning and Google data collection referenced in the dialog. This is confusing. Is location services provided by Google, or Huawei? Note also that I have little confidence in the promise that no “personal information” will be collected. The intention may be there, but history suggests that it is often pretty easy to identify the person from so-called non-personal information. It is better not to send the data at all if you care about privacy. 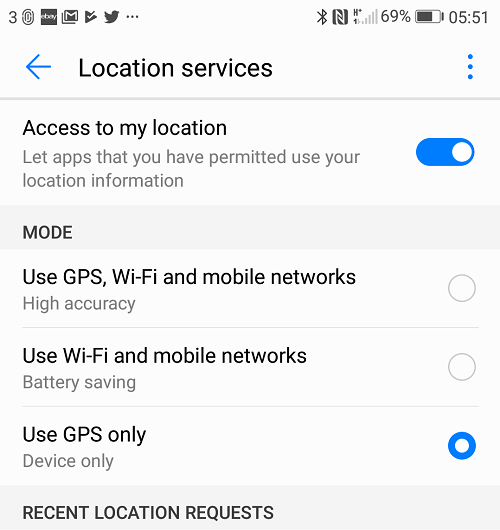 Huawei’s only suggestion if you do not agree is not to use location services. Or throw your device in the bin. 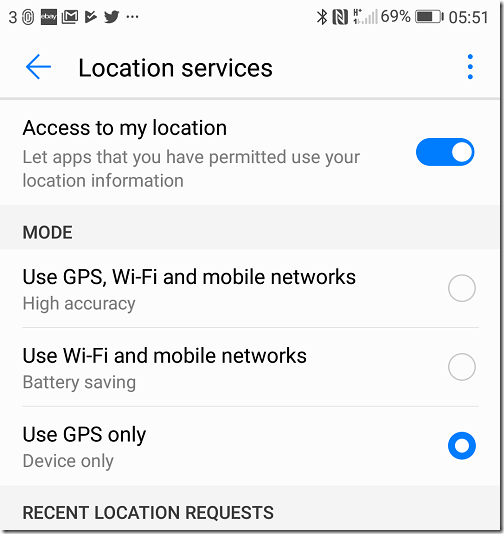 Having agreed all this data collection, note that you can still turn off wi-fi scanning and Bluetooth scanning in the advanced settings of Google location services. Is this respected though by Huawei? It is hard to tell. Finally, note that Google now strongly encourages developers to use the Google Play location API rather than the Android location API. This all seems like bad news if, like me, you want to minimize the location data that you share. 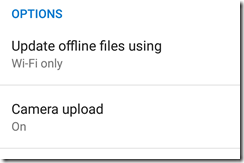 A feature of Microsoft’s OneDrive cloud storage is that you can set it to upload photos from your smartphone automatically. It is a handy feature, in part as a backup in case the you lose your mobile, and in part because it lets you easily get to them on your PC or Mac, for editing, printing or sharing. This feature used to work reliably on Windows Phone but I have not found it so good on Android. Photos never seem to upload in the background, but only when you open the OneDrive app and tap Photos. Even then, it seems to stop uploading from time to time, as if everything is up to date when it is not. The fix that I have found is to open OneDrive settings by tapping the Me icon (not a particularly intuitive place to find settings, but never mind). Then I turn Camera upload off. Go back to Photos. 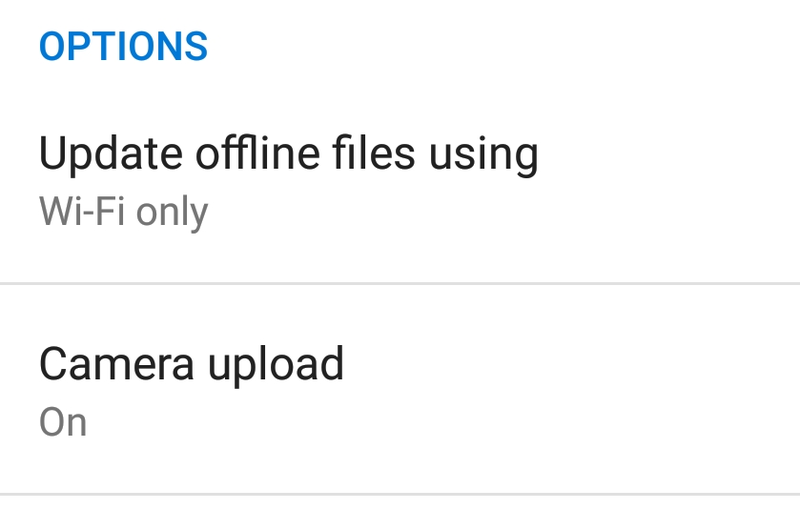 Go back to settings and turn Camera upload on again. It always kicks it back into life. It is worth noting of course that Google Photos also has this feature and it is likely to be enabled, unless you specifically took care not to enable it. And cloud storage of photos on Google is free if you choose “High quality” for upload size. If you choose “Original” for upload size, you get 15GB free photo storage. 1. The Windows 10 Photos app integrates with OneDrive, showing previews of your images without downloading them and letting you download on demand. 4. For consumers, it probably does not make sense to spread your stuff across both a Microsoft account and a Google account. If you have picked Microsoft, maybe because you use Windows or because you would rather trust Microsoft than Google with your personal data, then you would want your photos to be in OneDrive rather than Google Photos. It is therefore unfortunate that in my experience it does now work right. I am not sure if this is just a bug in the app, or something to do with Android. In the end though, it is just another niggly thing that pushes Android users away from Microsoft and towards Google services. 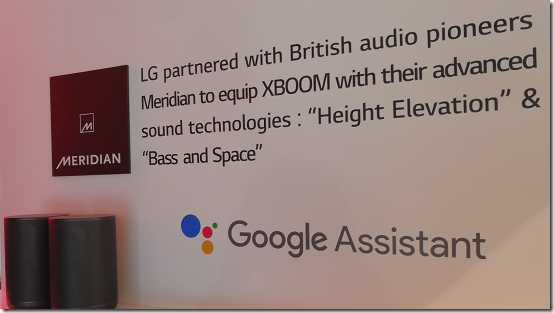 Google Assistant was all over IFA in Berlin. What are the implications? 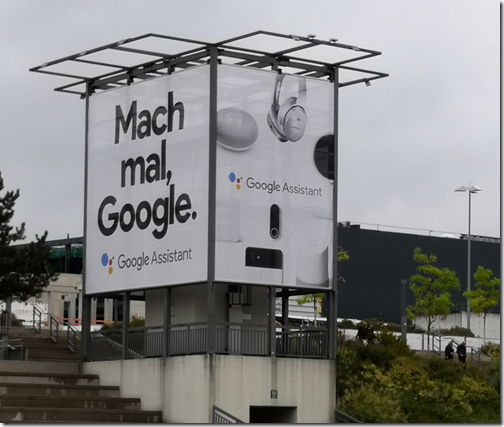 Last week I attended IFA in Berlin, perhaps Europe’s biggest consumer electronics event, and was struck by the ubiquity of Google Assistant. The company spent big on promoting its digital assistant both outside and inside the venue. Mach mal, Google; or in English, Go Google. 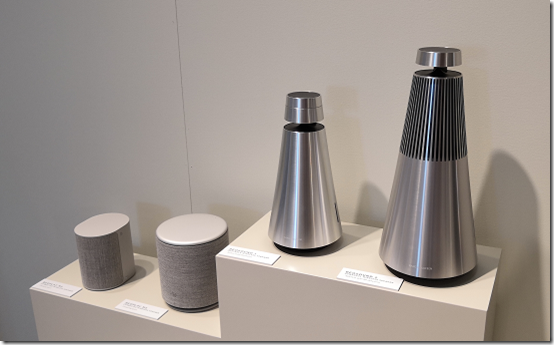 Bang & Olufsen with its smart speakers. 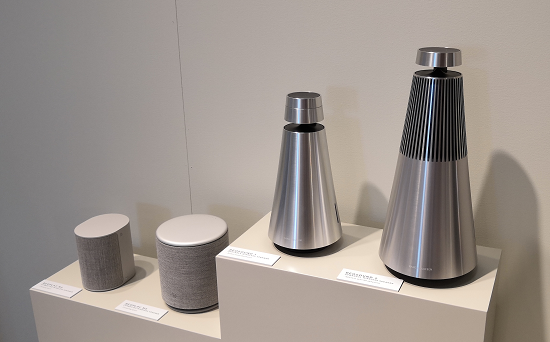 No logo, but it is using Google Assistant both as a feature in itself (voice search and so on) and to control other audio devices. 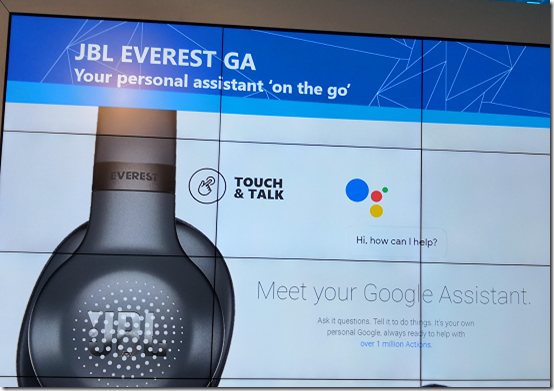 I was only at IFA for the pre-conference press days so this is just a snapshot of what I saw; there were many more Google Assistant integrations on display, and quite a few (though not as many) for Amazon Alexa. It is fair to say then that Google is treating this as a high priority and having considerable success in getting vendors to sign up. Google Assistant really only needs three things in order to work. A microphone, to hear you. An internet connection, to send your voice input to its internet service for voice to text transcription, and then to its AI/Search service to find a suitable response. And a speaker, to output the result. 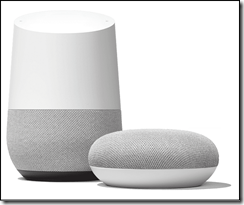 You can get it as a product called Google Home but it is the software and internet service that counts. Vendors of smart devices – anything that has an internet connection – can develop integrations so that Google Assistant can control them. 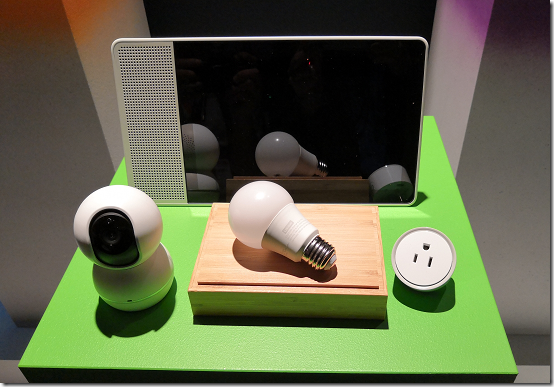 So you can say, “Hey Google, turn on the living room light” and it will be so. Cool. Amazon Alexa has similar features and this is Google’s main competition. Alexa was first and ties in well with Amazon services such as shopping and media. However Google has the advantage of its search services, its control of Android, and its extensive personal data derived from search, Android, Google Maps and location services, GMail and more. This means Google can do better AI and richer personalisation. 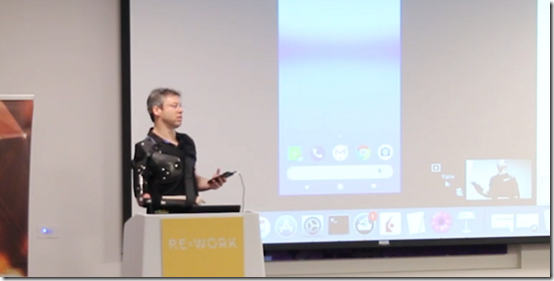 Back in March I attended an AI Assistant Summit in London organised by Re-Work. One of the speakers was Yariv Adan, a Product Lead at Google Assistant. I attend lots of presentations but this one made a particular impact on me. Adan believes that natural language UI is the next big technological shift. The preceding ones he identified were the Internet in the nineties and smartphones in the early years of this century. Adan envisages an era in which we no longer constantly pull out devices. “I believe the next revolution is happening now, powered by AI. I call it the paradigm switch to natural UI. Instead of humans adapting to machines, machines adapt to humans. What we’re trying to create is we interact with machines the same way we interact with each other, in a natural way. Meaning using natural language, showing things, pointing at things, assuming context, assuming a human-like memory, expecting personality, humour, opinion, some kind of an emotional connection, empathy. Note: If you ever read Isaac Asimov’s science fiction novels, you will recognise this as very like his Multivac computer, which hears and responds to your questions wherever you are. Adan gave a number of demonstrations. Incidentally, he never uttered the words “Hey Google”. Simply, he spoke into his phone, where I presume some special version of Google Assistant was running. In particular, he was keen to show how the AI is learning about context and memory. So he asked what is the largest castle in the UK where people live. Answer: Windsor Castle. Then, Who built it? When? Is it open now? How can I get there by public transport? What about food? In each case, the Assistant answered as a human would, understanding that the topic was Windsor Castle. “I found some restaurants within 0.4 miles,” said the Assistant, betraying a touch of computer-style logic. “Thank you you’re awesome,” says Adan. “Not a problem”, responds the Assistant. This is an example of personality or emotion, key factors, said Adan, in making interaction natural. Adan also talked about personalisation. “Show me my flight”. The Assistant knows he is away from home and also has access to his mailbox, from where it has parse flight details. So it answers this generic question with specific details about tomorrow’s flight to Zurich. “Where did I park my car?” In this case, Adan had taken a picture of his car after parking. The Assistant knew the location of the picture and was able to show both the image and its place on a map. An earlier speaker at the Re-Work event (sorry I forget who it was) noted that voice systems give simplified results compared to text-based searches. Often you only get one result. Back in the nineties, we used to talk about “10 blue links” as the typical result of a search. This meant that you had some sort of choice about where you clicked, and an easy way to get several different perspectives. Getting just one result is great if the answer is purely factual and is correct, but reinforces the winner-takes-all tendency. Instead of being on the first page of results, you have to be top. 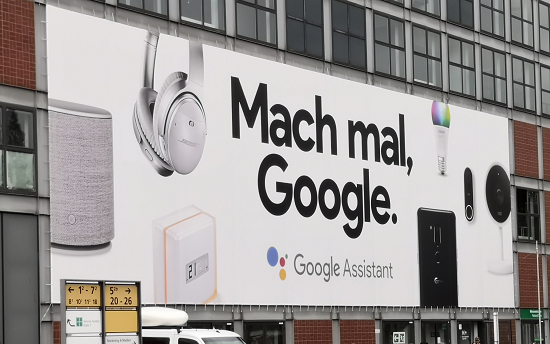 Or possibly pay for advertising; that aspect has not yet emerged in the voice assistant world. If we get into the habit of shopping via voice assistants, it will be disruptive for brands. Maybe Amazon Basics will do well, if users simply say “get me some A4 paper” rather than specifying a brand. Maybe more and more decisions will be taken for you. “Get me a takeaway dinner”, perhaps, with the assistant knowing both what you like, and what you ate yesterday and the day before. All this is speculation, but it is obvious that a shift from screens to voice for both transactions and information will have consequences for vendors and information providers; and that probably it will tend to reduce rather than increase diversity. What about your personal data? This is a big question and one that the industry hates to talk about. I heard nothing about it at IFA. The assumption was that if you could turn on a light, or play some music, without leaving your chair, that must be a good thing. 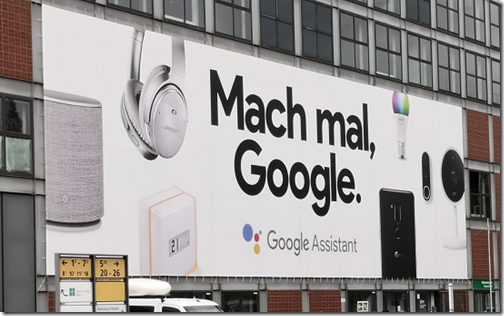 Yet, having a device or devices in your home listening to your every word (in case you might say “Hey Google”) is something that makes me uncomfortable. I do not want Google reading my emails or tracking my location, but it is becoming hard to avoid. 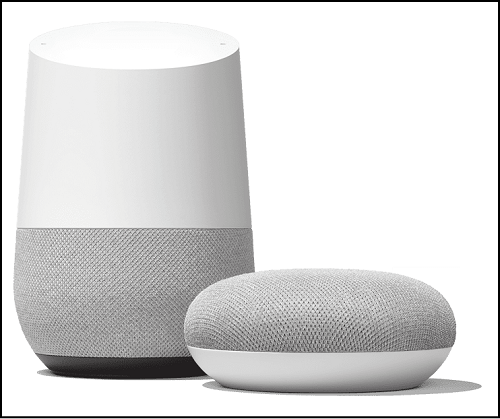 For most people, Google Assistant will just be a feature of their TV, or audio system, or a way to call up recipes in the kitchen. From Google’s perspective though, it is safe to assume that the ability to collect data is a key reason for its strong promotion and drive behind Google Assistant. That data has enormous value. Targeted advertising is the start, but it also provides deep insight into how we live, trends in human behaviour, changing patterns of consumption, and much more. When things are going wrong with our health, our finances or our relationships, it is not implausible that Google may know before we do. This is a lot of power to give a giant US corporation; and we should also note that in some scenarios, if the US government were to demand that data be handed over, a company like Google has no choice but to comply. Personalisation can make our lives better, but also has the potential to harm us. An area of concern is that of shared risk, such as health insurance. Insurers may be reluctant to give policies to those people most likely to make a claim. Could Google’s data store somehow end up impacting our ability to insure, or its cost? Personalisation is always a trade-off. Organisation gets my data; I get a benefit. I shop at a supermarket and this is fairly transparent. I use a loyalty card so the shop knows what I buy; in return I get discount points and special offers. In the case of Google Assistant it is not so transparent. The EU’s GDPR legislation has helped, giving citizens the right to access their data and the right to be forgotten. However, we are still in the era of one-sided privacy policies and in many cases the binary choice of agree, or do not use our services. This becomes a problem if the service provider has anything close to a monopoly, which is true in Google’s case. Regulation, it seems to me, is exactly the right answer to the risks inherent in putting too much power in the hands of a business entity. For myself, I am happy to cross the room and turn on the light, and to find my flight in my calendar. The trade-off is not worth it. But if Adan’s “ambient entity” comes to pass (which is actually most likely Google) I am not sure of the extent to which I will have a choice. Adan’s work is terrific and the ability for machines to converse with humans in something close to a natural way is a huge technical achievement. I have nothing but respect for him and his team. It is part of a wider picture though, about data gathering, personalisation, and control of information and transactions, and it seems to me that this deserves more attention. Gartner has published a paper and Magic Quadrant on Mobile App Development Platforms (MDAPs), which you can read for free thanks to Progress, pleased to be named as a “Visionary”, and probably from other sources. 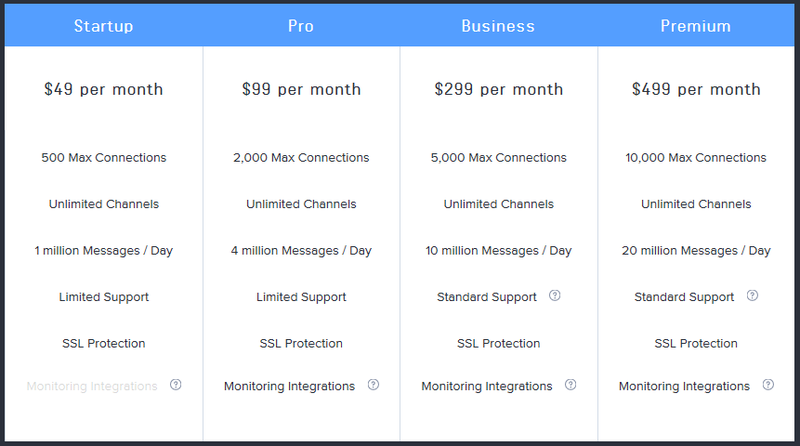 Back-end services that can be used by diverse clients, not just the vendor’s proprietary tools. Kony, which offers Kony Visualizer for building clients, Kony Fabric for back-end services, and Kony Nitro Engine, a kind of cross-platform runtime based on Apache Cordova . Of course there are plenty of other vendors covered in the report. Further, because this is about end-to-end platforms, some strong cross-platform development tools do not feature at all. A few observations. One is the prominence of Apache Cordova in these platforms. Personally I have lost enthusiasm for Cordova, now that there are several other options (such as Xamarin or Flutter) for building native code apps, which I feel deliver a better user experience, other things being equal (which they never are). With regard to Microsoft, Gartner notes the disconnect between PowerApps and Xamarin, different approaches to application development which have little in common other than that both can be used with Azure back-end services. I found the report helpful for its insight into which MDAP vendors are successfully pitching their platform to enterprise customers. What it lacks is much sense of which platforms offer the best developer experience, or the best technical capability when it comes to solving those unexpected problems that inevitably crop up in the middle of your development effort and take a disproportionate amount of time and effort to solve. Microsoft delivered another strong set of figures in its latest financial results, for the period April-June 2018. Total revenue of $30.085 million was up 17% year on year, and all three of the company’s sectors (Office, Azure and consumer) showed strong growth. What’s notable? Largely this is more of the same. A few things to note. Linked in revenue increased 37% year on year – an acquisition that seems to be making sense for the company. Dynamics 365 revenue grew by 65%. The Dynamics story is all about cloud synergy. 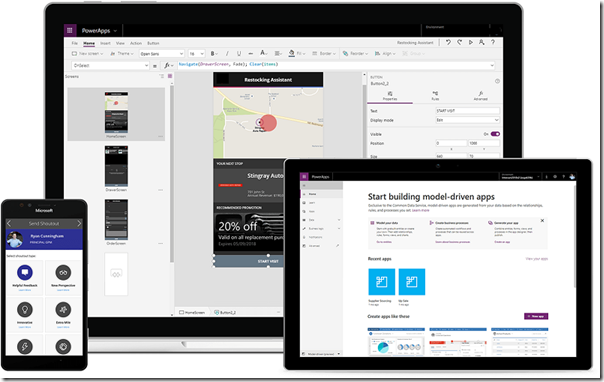 As an on-premises product Dynamics CRM (the part of the suite I know best) was relatively undistinguished but as a cloud product the seamless integration between Office 365 and Dynamics 365 (and Azure Active Directory) makes it compelling. Windows 10 is doing OK, possibly as more businesses heave themselves off Windows 7 and buy new PCs with OEM licenses as they do. Even areas in which Microsoft is far from dominant did well. Gaming was up 39%, Surface 25% and Search advertising up 17%. The biggest growth in the quarter, according to the breakdown here, was in Azure. up 89%. This growth is not without pain; the Register reports capacity issues in the UK South region, for example, with users getting the message “Unfortunately, due to high demand for virtual machines in this region, we are not able to approve your quota request at this time.” You can still create VMs, but not necessarily in the region you want. Will Microsoft outpace AWS? My take on this has not changed. 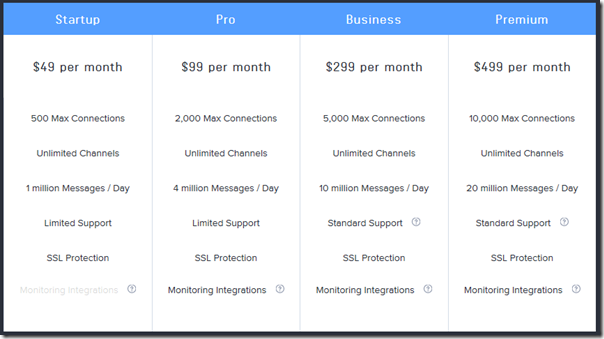 AWS does very little wrong and remains the pre-eminent cloud for IAAS and many services by some distance. What AWS does not have is Office 365, or armies of Microsoft partners helping enterprise customers to shunt more and more of their IT infrastructure into Azure. Microsoft makes more money from licensing: Windows Server, SQL Server, Office 365 and Dynamics seats, and so on. AWS does more business at a lower margin. These are big differences. I see it as unlikely that Azure will overtake AWS in the provision of essential cloud services like VMs, containers, cloud storage and so on. AWS also has a better reliability track record. 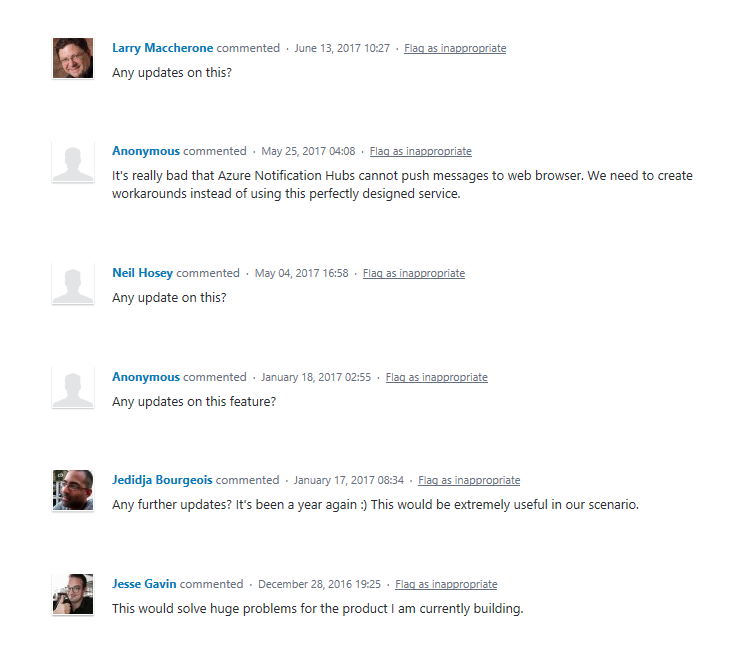 However, the success of Azure means that enterprise customers no longer need to go to AWS to get the benefits of cloud. Perhaps the more interesting question is the extent to which AWS (or Google) can persuade enterprise customers to shift away from Microsoft’s high-margin applications. Longer term, there is significant risk for the company in its retreat from mobile. We are now seeing Google work hard in the laptop market with Chromebooks alongside Android mobile. Coming sometime is Google Fuchsia which may be a single operating system for both. It is worth recalling that Microsoft built its success on winning users for its PC operating system; and that IBM lost its IT dominance by ceding this to Microsoft. 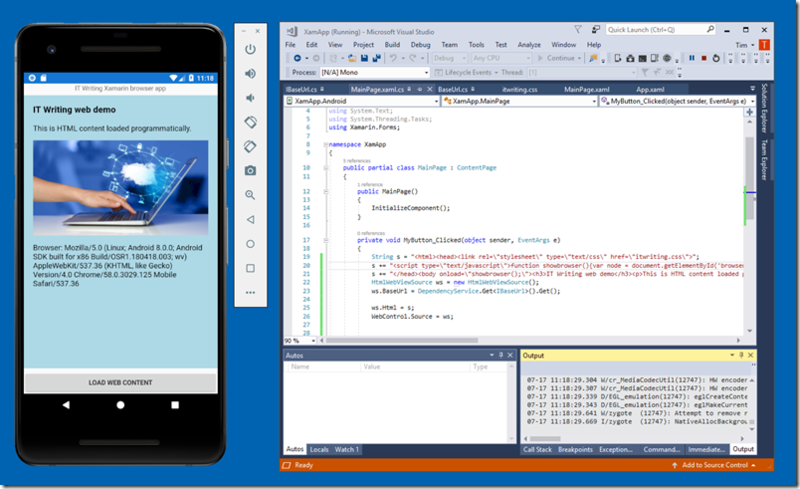 A new Community Edition of Delphi and C++Builder, visual development tools for Windows, Mac, Android and iOS, has been released by Embarcadero. The Community Edition license applies solely if Licensee cumulative annual revenue (of the for-profit organization, the government entity or the individual developer) or any donations (of the non-profit organization) does not exceed USD $5,000.00 (or the equivalent in other currencies) (the “Threshold”). If Licensee is an individual developer, the revenue of all contract work performed by developer in one calendar year may not exceed the Threshold (whether or not the Community Edition is used for all projects). Otherwise, the Community Editions are broadly similar to the Professional Editions of these tools. Note that even the Professional Edition lacks database drivers other than for local or embedded databases so this is a key differentiator in favour of the Architect or Enterprise editions. An annoyance is that you cannot install both Delphi and C++ Builder Community Editions on the same PC. For this you need RAD Studio which has no Community Edition. Delphi and C++ Builder are amazing tools for Windows desktop development, with a compiler that generates fast native code. For cross-platform there is more competition, not least from Microsoft’s Xamarin tools, but the ability to share code across multiple platforms has a powerful attraction. Get Delphi Community Edition here and C++Builder Community Edition here. 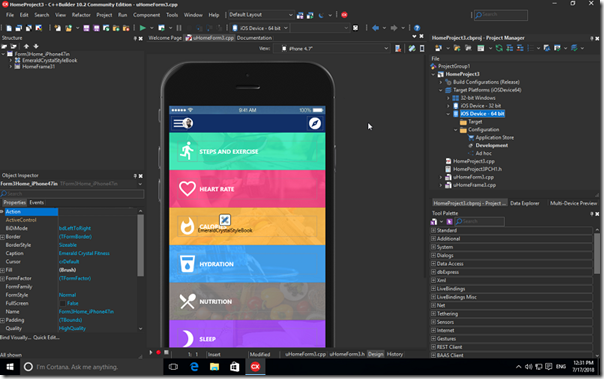 Xamarin Forms is a key framework for C# and .NET developers since it lets you target Android, iOS and to some extent Windows (UWP and therefore Windows 10 only) with maximum code reuse. I have a longstanding interest in embedded web browser controls and was glad to see that Xamarin Forms supports a capable WebView control. The WebView wraps Chrome on Android, Safari on iOS, and Edge on UWP. I did a quick hands-on. 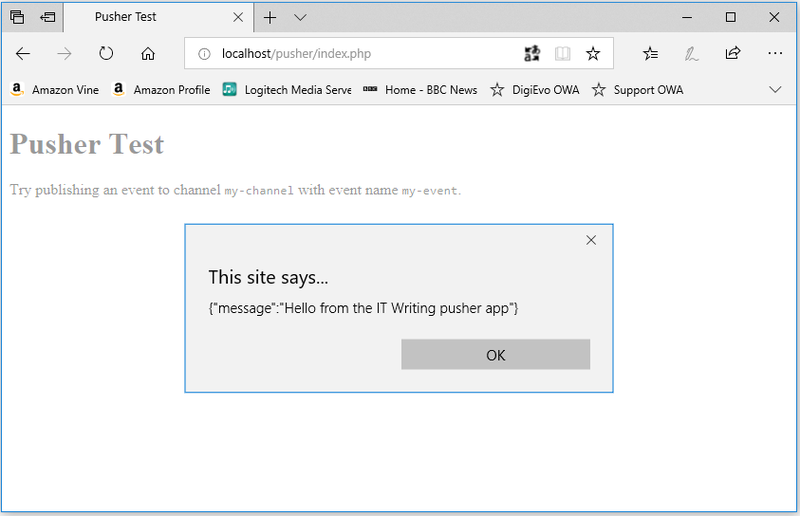 In this example (running in the Android emulator on Hyper-V, of course), the HTML is generated programmatically and the CSS loaded from local storage. I also added some script to show the User Agent string that identifies the browser. There are a few things needed to make this work. Some XAML to put the WebView on a page. Then to load content into the WebView you need an HTMLWebViewSource object. If you are loading external files, you must set the BaseUrl property of this object as well as the HTML itself. The BaseUrl tells the control where to look for files that have a relative address. 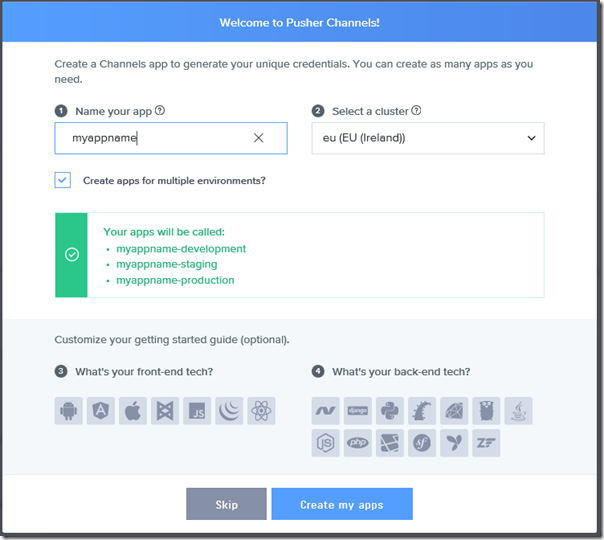 This varies according to the target platform, so you use the Xamarin Forms Dependency Service to set it correctly for each platform. In Visual Studio, you place the files you want to load in the appropriate folder for each platform. For Android, this is the Assets folder. That is about all there is to it. As you can see from the above screenshot, I wrote very little code. 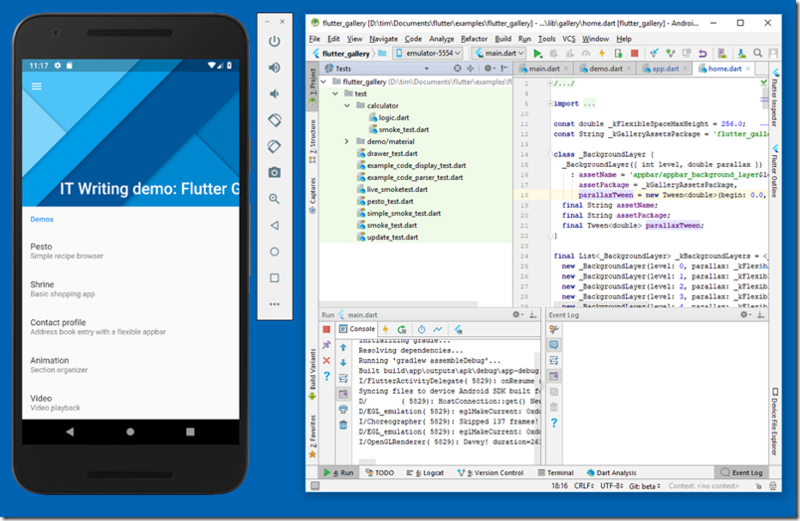 Great news that the Android emulator now supports Hyper-V, but how do you enable it? Note: this is not the same as just enabling Hyper-V. 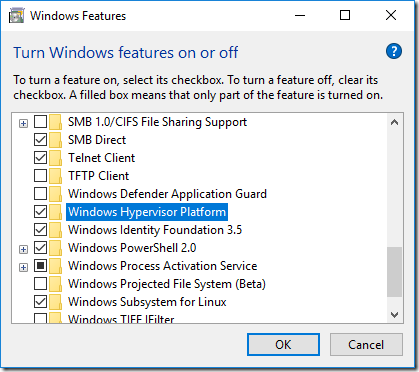 The Windows Hypervisor Platform, or WHPX, is an API for Hyper-V. Read about it here. Reboot if necessary and run the emulator. TroubleshootIng? Try running the emulator from the command line. will run the AVD called avdname using WHPX (Windows Hypervisor Platform). If it fails, you may get a helpful error message. 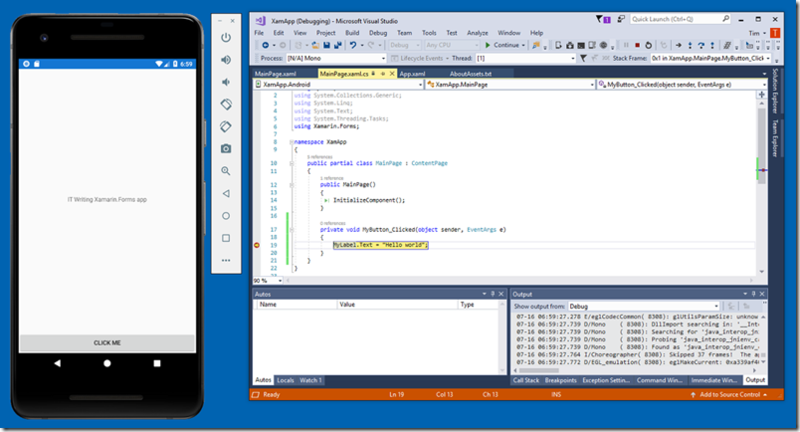 You can also use the emulator from Visual Studio, though you need Visual Studio 2017 version 15.8 Preview 1 or higher with the Xamarin tools installed. 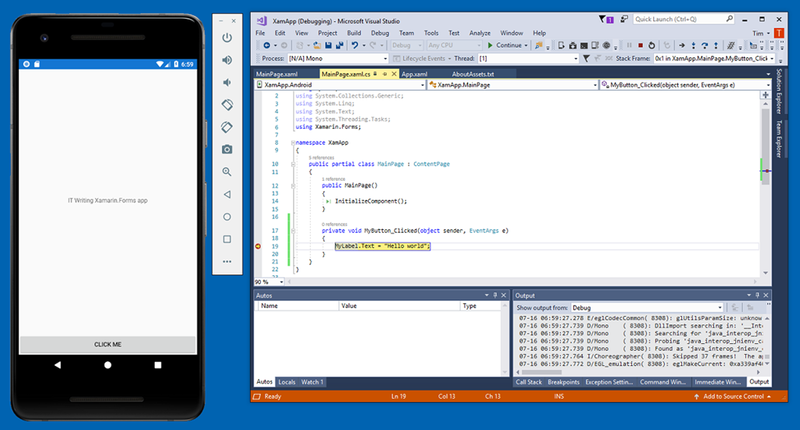 That said, I had some success with starting the Hyper-V emulator separately (use the command above), then using it with a Xamarin project in Visual Studio 15.7.5. An annoying issue for Android developers on Windows is that the official Android emulator uses Intel’s HAXM hypervisor platform, which is incompatible with Microsoft’s Hyper-V. The pain of dual-boot just to run the Android emulator is coming to an end. Google has announced that the latest release of the Android Emulator will support Hyper-V on both AMD and Intel PCs. This a relief to Docker users, for example, since Docker now uses Hyper-V by default. Google Product Manager Jamal Eason has made a rather confusing post, positioning the new feature as mainly for the benefit of developers with AMD processors. Intel HAXM does not work with AMD processors.”Thanks to on-going development by Intel, the fastest emulator performance on Windows is still with Intel HAXM,” says Eason, stating that HAXM remains the default on Intel PCs and is recommended. You need to use Hyper-V at the same time. You are using an AMD CPU. 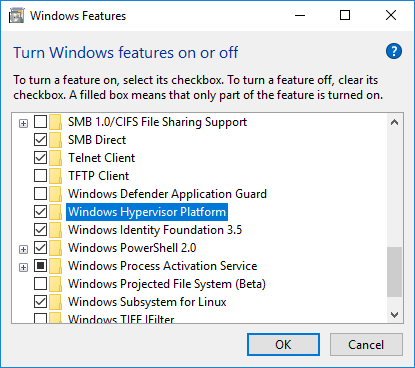 The new feature is “thanks to a new Microsoft Windows Hypervisor Platform (WHPX) API and recent open-source contributions from Microsoft,” says Eason. 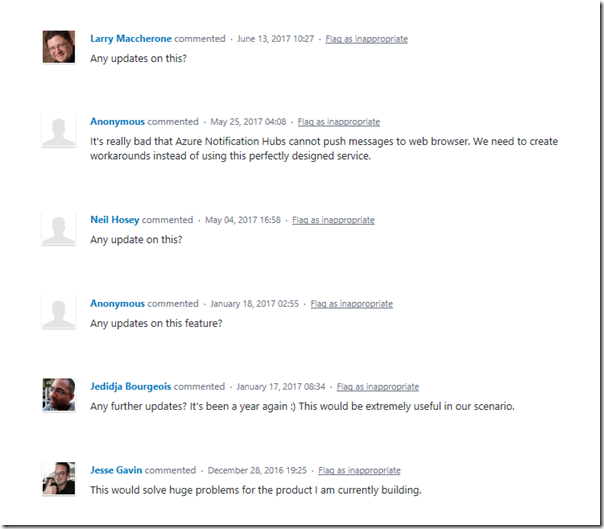 It is another case of Microsoft doing the hard work to make Windows a better platform for developers, even when they are targeting non-Windows platforms (as is increasingly the case). 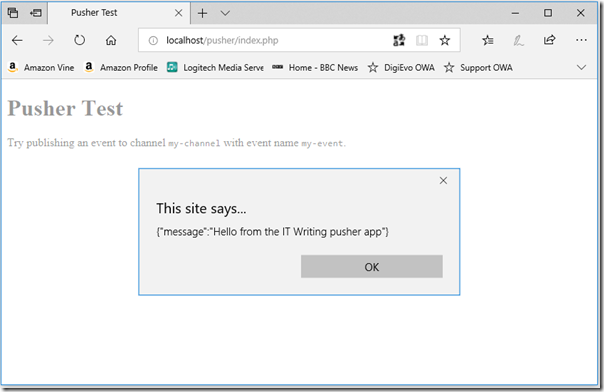 Pusher is a London company which runs cloud services for publish/subscribe in web and mobile applications. The idea is to deliver real-time updates, a concept that has many use cases. Examples include price updates in finance apps, status updates to track a delivery, news updates, or anything where users want to monitor progress or keep in touch with fast-moving developments. Of course you could roll your own solution for this but what you get with Pusher is all the plumbing pre-done for many different clients and automatic scalability. Pusher also has a service called Beams (formerly Push Notifications) which lets you send notifications to Android and IOS apps. 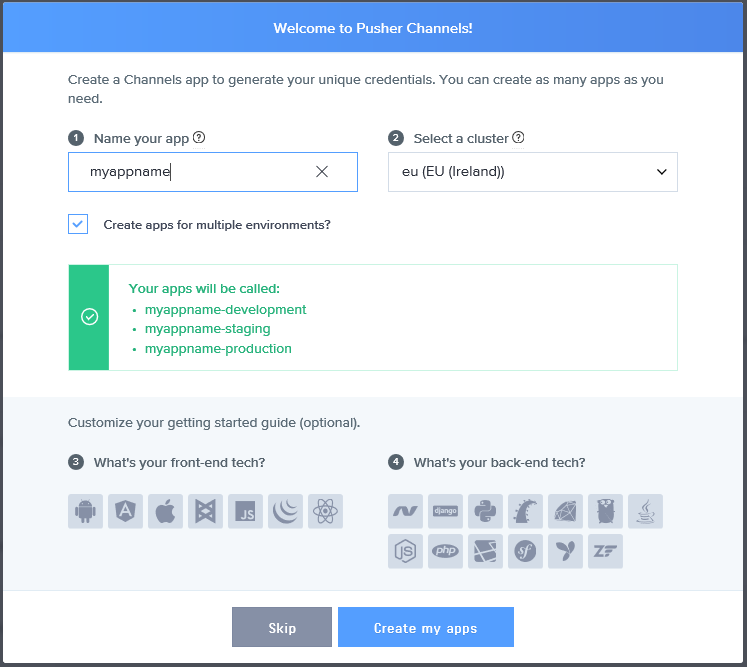 You are saving considerable development time though, and as Google and Apple update their SDKs or change the rules, Pusher will presumably adapt accordingly. It is odd that Microsoft, with all its drive behind Azure, is still in the habit of leaving customers in the dark in certain areas.